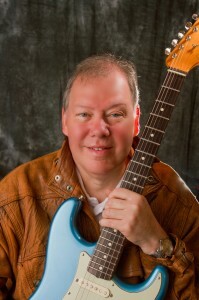 I am Colin Berrido and I offer Guitar Lessons in Surrey. I run a dedicated Teaching Studio situated on the Surrey, Hampshire and Berkshire borders in Bagshot (near Lightwater and Windlesham close to Camberley). This site is all about playing electric, acoustic and bass guitar as well as ukulele and mandolin across a wide and varied range of genres – classic rock, blues, metal, country, folk and jazz. If it’s got strings on it I will get you up and playing! All experience levels are welcome from absolute beginners, through intermediate players to experienced performers and working musicians. I offer competitive rates – which includes most of your study materials via use of computer based programs, so I have the facility to quickly customize sessions to an individual student’s needs, plus flexible teaching times. Having over 50 years experience of playing, performance, recording and teaching I can help the budding star of tomorrow or the current rock god get the best out of their playing by sharing practical tips on stage craft as well as choosing the right guitar and set up for you. I hold a Teaching Diploma from the London College of Music and I am also a Member of the Registry of Guitar Tutors plus I have been DBS checked and approved. Tuition ranges from getting an absolute beginners playing from their very first lesson, through to coaching and mentoring more experienced players and to getting students through formal music examination grades – to date I have had over 500 passes (with no failures) with greater than 80% getting a Distinction (greater than 85%) or Merit grading (greater than 75%). The secret? Simple really – good basic planning and organisation (understanding what you need to focus on to pass) coupled with enthusiasm and hard work (sorry to mention that!). In addition I have recording and video facilities on request so that the student can get fast independent feedback on their performances which they can take away for further review and assessment.